Gray or clay colored skin as adults. Brighter, speckled skin when younger. Distinctive light yellow tongue. Body, head, and tail undulate from side-to-side when walking. Hold tail and body rigid when running. 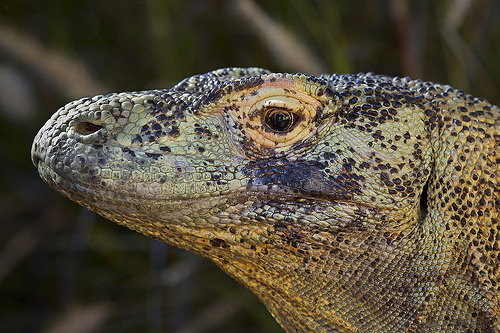 Good swimmers, like other monitor lizards. Climb trees as youngsters. Primarily diurnal. Activity peaks during mid-morning and mid-afternoon. Spend most time thermoregulating and sleeping. Solitary. Interact with one another only during breeding or at feeding/carcass sites. Wide carnivorous diet. Feed on carrion and hunt animals along game trails. Able to eat a lot of food very quickly! © 1998-2019 San Diego Zoo Global. Population estimates updated Aug 2018.